King of the Planets. Ruler of the Solar System. According to folklore, Jupiter is where boys go to get more stupider. Endless research fails to produce the name of these brave boys that set foot on Jupiter's gassy surface. It is to be believed they perished in their endless quest for stupidity and their names stricken from records to postpone NASA's inevitable embarrassment. Jupiter is the largest of the Planets and is currently being visited by Juno, NASA's planetary satellite. A planet so massive that even the famous Red Spot is several times larger than the Earth. 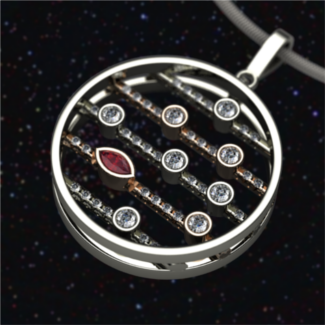 Made with 14K White Gold or Sterling Silver this concept piece uses a Marquee Ruby to represent the big red spot on Jupiter's surface. The red spot is actually a huge storm that has been raging on since the planet's discovery. You could fit two entire Earths in the spot, and it is unknown how far into the planet the storm actually goes. Hopefully NASA's Juno can get to the... bottom of this mystery. 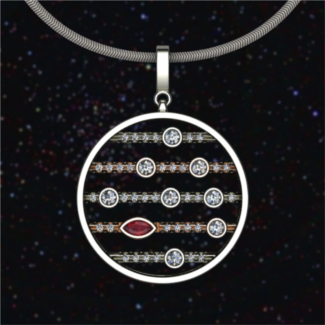 Three bars are made of White Gold and two bars are made out of Pink Gold to represent the different stripes of Jupiter's image. We offer free shipping Domestic or International on any gold variation for this ring.